When I got married, I thought that it was such a privilege to be a "military wife". Like what my 18th AML mom Cherry said, it takes a special woman to be one. With the pain of waiting so long for the husband to come home and the responsibility of solely raising a family, I'm very sure an ordinary wife will easily give up. But sorry to burst your bubbles ladies, there are stronger breed of military "misis". Not that I have met a lot, but I am proud I know one. Does Magdalo sound familiar to you? I am not equipped with the correct information as I have to ask help from my husband first but this link might help. What does it have to do with my blog, you ask? My 29th AML is the wife of one of the 321 soldiers who took part in the 2003 Oakwood Mutiny against Arroyo administration. Where were you during that time? For Mrs. Mabulo, I don't where she was and what she was doing, but all I can say is I admire her strength for braving it all. If you are to look at how her family is doing now, you will not even think that they have gone through that phase. What you would actually see is that she is the proudest mom of Junior Master Chef Pinoy Edition finalist, Louise. During our interview, I gave her the liberty to introduce her daughter because we both know that what Louise has become could be an inspiration for us, who dream nothing but the best for our children. 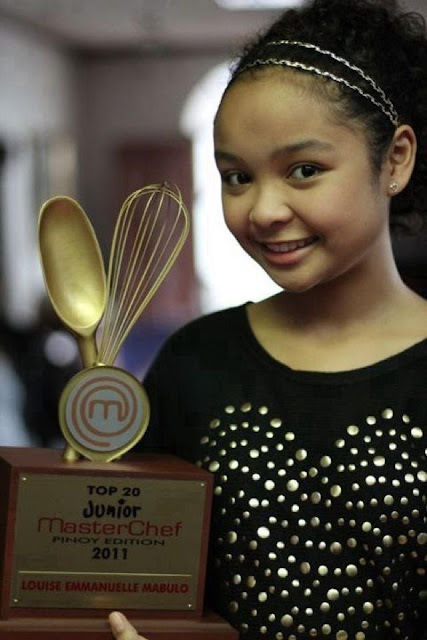 "My daughter Louise is a Junior Master Chef Finalist, a Breville Philippines ambassador, Operation Smile Ambassador and has 2 dishes in Bigg's Diner available in 9 outlets in Bicol region and Batangas area (10% of the royalty will go to EducNation to help unfortunate kids in school), 1 dish in Pancake House before (Cabbage wrapped Lumpia) and was listed as Top Ambassador by author and writer Bryant Macgill. She has taken her Oltis Lenon School Ability Test with flying colors ( college level at 14 years old), guest judge in different cooking competitions such as Manila and Food Beverage Expo, De La Salle Saint Benilde, Angel Evaporada and many more. She conducted cooking demo in World Food Expo, Hotel Intercontinental Manila, Rustan's Makati, SM Malls, Avenue Plaza Hotel, Makati Medical Center, HORECA fair, etc... She is a writer herself, made an article in Manila Bulletin's My Way. She is now gearing up for a book launch on August 31 as one of the contributors. She has been a speaker for different career orientation for college students (even at 14). She will speak about Money Matters for Bangko Sentral ng Pilipinas in Naga on August 28. My daughter is part of the Homeschool (The Master's Academy) and now, preparing for 3rd yr High School. She loves swimming, drawing ,reading and most of all cooking." I imagined a beaming mom with pride happily talking about her unica hija's achievements as I read this. What registered to me is how Michelle is as a mom and wife --- always putting her family first before herself. So this time, I'd like to give the spotlight to her. PET PEEVE: I complained a lot before, but after learning that you attract more if you complain about certain things. I tend to deviate and look at the positive side on it. After so many things that had happened to our family from those Magdalo days when we, yes, "we " were always in pursuit by the government agents then he was locked in for 3 months and being tried to court for several times. To becoming an OFW (even Consul tried to expatriate my husband but because there is no treaty existing between UK and the Philippines, they failed). Finally after 4 yrs in the UK, he was cleared by the Dept of Justice and finally we were able to go back to our homeland and run and elected as Mayor of his town in CamSur. Sometimes it's so ironic to think that after all the whirlwind, it's all part of the destiny God has designed for you. Queen B says: I like how she looks at life now. For most of us, if asked about our pet peeves, we will itemize every single thing that irks us and with gusto. But with Michelle, who had been in a life of uncertainty few years back, there's no room for hate. Only dreams to fulfill for her family, especially for her pretty teenager. 2013 GOAL: Most of my goals for 2013 has been achieved and I thank God for it.